Bull trout and westslope cutthroat trout are found in the Crown. 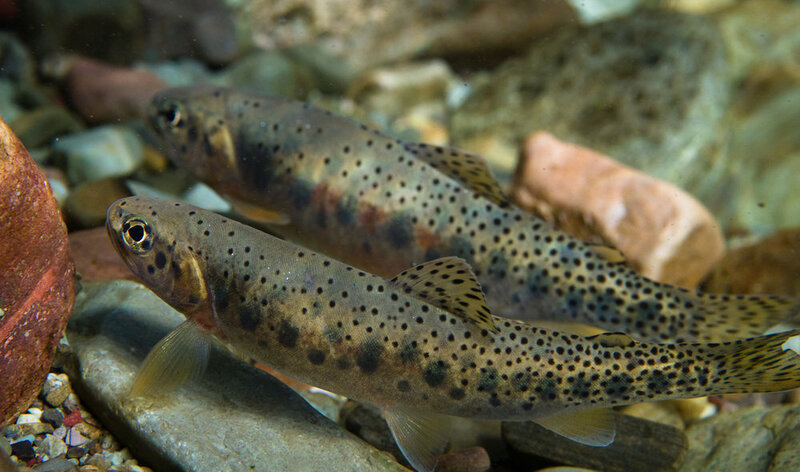 Increasing stream temperatures are expected to reduce the availability of suitable habitat for bull trout and increase levels of hybridization between westslope cutthroat trout and non-native trout species. In November 2014, the Crown Managers Partnership, The Wilderness Society, Crown Conservation Initiative and the Northern Rockies Adaptation Partnership held a workshop in Kalispell, MT entitled "Piloting Adaptation Strategies to Reduce Vulnerability and Increase Resiliency for Native Salmonids in the Crown of the Continent Ecosystem." Following the workshop a shortlist of potential projects were identified that focused on increasing resiliency, securing and restoring critical habitat and protecting native populations. Implement best management practices to other locales (if translocation is unsuccessful). The topic for the 2018 CMP Forum was Native Salmonid Recovery in the Crown. This forum brought together fish biologists, managers, academia and Tribes and First Nations from around the Crown to collaborate on high priority areas and recovery strategies. Thank you to Johnny Armstrong, USGS for the use of the photos on this page.